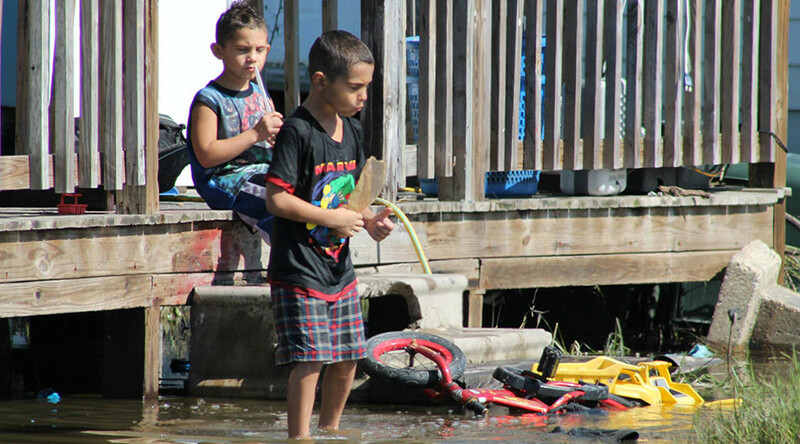 The residents of a sinking Louisiana island will become the first American climate refugees. A $48 million grant will move the entire community to a drier location as part of a $1 billion federal program to deal with the effects of climate change. Isle De Jean Charles’ 60 residents, mostly members of the Biloxi-Chitimacha-Choctaw tribe, have lived on the strip in the bayous of southeastern Louisiana for generations. Their ancestors are buried in the island’s cemetery. The land is now waterlogged, dying as it drowns in salt and sinks into the swamp. The tribe has lived in the area for 170 years. Its ancestors moved there in the 1830s to escape the consequences of the Indian Removal Act, which authorized then-president Andrew Jackson to negotiate with southern Indian tribes in order to get them to move onto federal territory west of the Mississippi River in exchange for their ancestral homelands. The tribe that settled on Isle De Jean Charles survived by fishing and subsistence farming, which has become more difficult due to coastal erosion. The $48 million grant will finance the first resettlement plan in the world prompted by climate change. The program will move the island’s residents to drier land where no community yet exists. All of the funds have to be spent by 2022. “We see this as setting a precedent for the rest of the country, the rest of the world,” said Marion McFadden, who is running the program at the Department of Housing and Urban Development (HUD). Climate change could displace between 50 and 200 million people by 2050, according to the United Nations Institute for Environment and Human Security and the International Organization for Migration. Most of the refugees are likely to be farmers and fishermen whose livelihoods depend on their environments. Residents will not be forced to leave, but administrators say it is not worth rebuilding roads and infrastructure on the island because of the risk of flooding and rising sea levels. Where the community will go now has not yet been determined. Some 90 percent of the island’s land mass has been washed away since the 1950s due to a combination of land erosion and hurricanes, as well as loggers and oil companies cutting channels into the strip. Louisiana loses a land mass the size of Manhattan every year. The grant is part of $1 billion that HUD has set aside to build strong levees, dams, and drainage systems to help communities in 13 states adapt to climate change. Honolulu and Miami are also in trouble. If Honolulu’s Ala Wai Canal were to flood, more than 100,000 people would be affected.